Just Eat, which began in Denmark in 2001 but is now based in London, operates in 13 countries. Just Eat, and rivals such as Uber and Deliveroo, have expanded the food home delivery market and are battling for market share. 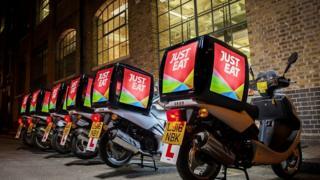 Just Eat said the acquisition would help to accelerate its growth. The deal must be approved by the Competition and Markets Authority. David Buttress, Just Eat chief executive, said he was confident the UK deal would get the nod from regulators. "We think this brings benefits to both restaurants and consumers rather than diminishing them," he said. David Reynolds, analyst at Jefferies, said the combination of Just Eat and Hungry House made sense. "This deal not only consolidates the UK effectively, it also removes the possibility of a more radical combination for Hungry House, with Deliveroo for example, that may have been perceived as a threat to Just Eat's UK competitive position," he said. David Buttress, chief executive of Just Eat, said: "Through this transaction, we would extend our market presence in the UK and sustain high levels of growth given the considerable opportunity in this market." Just Eat is spending £200m on the Hungry House deal, and 110m Canadian dollars (£66.1m) on SkipTheDishes. Shares in Just Eat rose 2.6% in morning trade to 615p, valuing the company at £4.15bn. Its shares have more than doubled since listing in 2014.